Be charmed and enchanted by Peru, Brazil & Argentina on this 18-day tour from Lima to Buenos Aires. Highlights include the natural wonder; Iguazu Falls. Journey through three countries that will fascinate you with their rich history, beautiful environment and iconic cultures. You’ll be charmed and enchanted during your time in Peru, Brazil and Argentina. From the World Heritage-listed Machu Picchu with its mysterious origins, to the friendly hospitality of the Sacred Valley inhabitants, and the passion and fire of Rio de Janeiro, there’s plenty to delight across this South American odyssey. Enjoy an authentic Andean feast and discover the lovely city of Cuzco. Stand atop one of the world’s greatest natural wonders, Iguazú Falls, and immerse yourself in the colour and movement of the iconic Brazilian city, Rio de Janeiro. Your journey concludes in Buenos Aires; learn about the rich Porteña culture and gastronomy of the ‘Paris of the Americas’. This itinerary is the perfect pace for you to relax and explore these fascinating destinations. Welcome to colourful Peru. Start your journey into wonder with an overnight stay in Lima. This morning fly to Cuzco, then travel to the Sacred Valley of the Incas. Your three night stay allows you to experience the history, unique lifestyle, culture and majestic scenery of this heartland of the former Inca Empire. Enjoy a walking tour through the charming village of Urubamba. Tonight, meet with your fellow travellers as you enjoy a private performance by local musicians complemented by a tapas style dinner. Join your expert local guide for a walking tour of Ollantaytambo, the site where Manco Inca defeated the Spanish conquistadors. Enjoy a delicious Andean feast at Hacienda Huayoccari, where you will learn about the daily life, traditions and work of the locals during a weaving demonstration. The afternoon is at leisure to explore the charming village of Urubamba. Enjoy a walking tour of the Pisac ruins and markets; or visit Moray and Inca salt pans. Alternatively, relax in your hotel with a spa treatment. Enjoy an unforgettable culinary experience of five different meats cooked in five different ways over an open flame, with spices and other ingredients grown in Tambo’s own organic garden. Travel through picturesque fields on your rail journey to Machu Picchu then spend time at the ancient Inca site. Be amazed as your expert local guides share the mysteries of these majestic ruins. Tonight relax at your charming hotel. Learn how to make two of the country’s signature offerings: ceviche and pisco sours, during a cooking demonstration. Then, marvel at the spectacular views from the glass dome carriages on your rail journey through the incredible Andes. Continue to the charming city of Cuzco and your luxurious hotel, in the heart of the historic centre. Your three night Special Stay is sure to be a highlight. The former capital of the Incan Empire, Cuzco is a city with incredible architecture. Uncover the history of this World Heritage-listed Site including Korichancha and the ruins of Sacsayhuamán fortress. Visit a community exclusively supported by Scenic. Meet the students and teachers at the local school and learn about their lifestyle. Uncover the secrets of the iconic Peruvian coffee and Pisco on a tasting tour or choose to explore the fascinating San Pedro food markets with a local guide followed by a cooking class. Alternatively, discover the picturesque San Blas artisan quarter on a walking tour. Fly to the magnificent natural wonder of Iguazú Falls for your three night Special Stay hotel, set inside the park gates. As a guest of the hotel you will be able to experience the sun setting over the top of the falls without the general public. Enjoy a leisurely tour to discover the Brazilian Falls before the park gates open to the public. Be awed by the world’s largest volume waterfall and experience an exciting jet boat adventure. Enjoy a Scenic Sundowners event of beverages and tapas. Optional flight - Soar over Iguazú Falls on an optional helicopter flight. (Additional expense). Discover the walkways across the top of the falls on the Argentinian side to the lookout where you will see the famous ‘Devil’s Throat’ and be awed by the sheer volume of water cascading over the falls. Fly to the vibrant city of Rio de Janeiro. A highlight will be your Special Stay, this elegant hotel provides the perfect place to spend your last two nights in Brazil. At Sugarloaf Mountain, the cable car takes you to the top of the peak, where you will enjoy Scenic Sundowner drinks while taking in the spectacular views of Rio and the surrounding landscape at sunset. Today you will discover the beating heart of this exotic city. Take a fascinating walking tour through downtown Rio, home to the Metropolitan Cathedral and the Municipal Theatre. Learn about Rio’s history and culture and appreciate the locals’ lifestyle. Ride the cogwheel railway to the top of Corcovado Mountain to see the famous Christ the Redeemer statue. Indulge in a mouth-watering Brazilian Churrascaria experience. Walk through the UNESCO biosphere reserve, Jardim Botânico (Botanical Garden) while learning about its unique history, or get an insider’s perspective on daily life in the favelas and enjoy an energetic capoeira show. Alternatively, discover how the old and modern parts of Rio’s downtown co-exist on a historical walking tour. Fly to Buenos Aires and transfer to your elegant hotel for a four night stay. La Boca’s colourful Caminito. This evening enjoy dinner at the Gala Tango show. Experience typical Porteña culture and gastronomy with a visit to a local Estancia, enjoy a wine tasting with expert sommeliers, a traditional Asado lunch and polo class. Take a tour with a local artist to uncover the vibrant urban art scene. Alternatively, discover the green side of Buenos Aires on a bike tour of the city’s parks and plazas, or bask in the marvellous architecture of the city’s belle époque on a walking tour. Join your Tour Director and fellow travellers for a farewell dinner and indulge your senses in one of Buenos Aires’ coveted closed-door restaurants while enjoying a modern Argentine meal with wine pairing – complete with an empanada making class. Say farewell as you transfer to the airport taking a lifetime of wonderful memories with you. 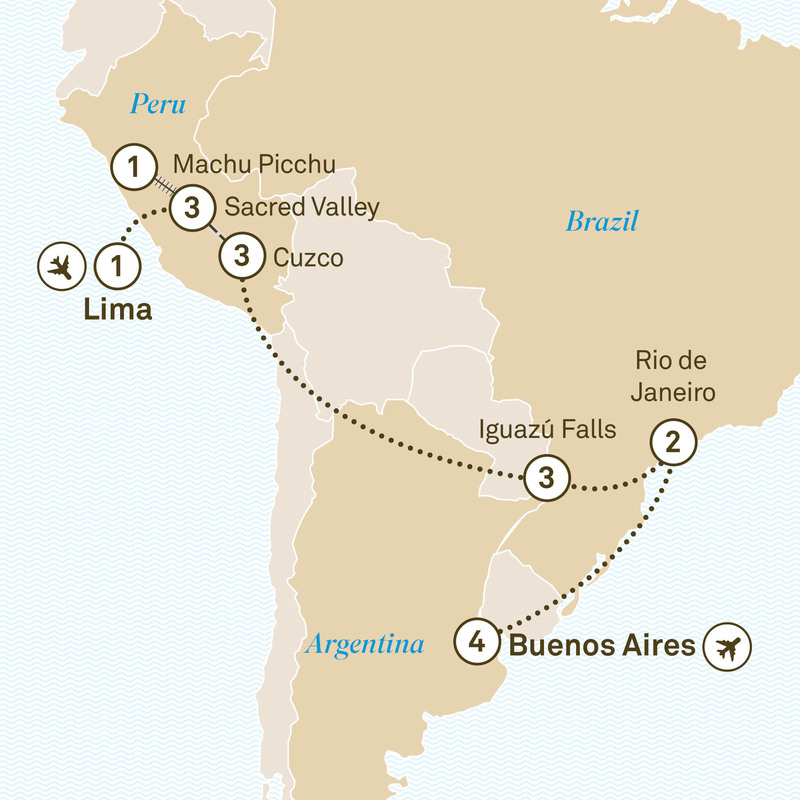 Explore South America on a 21-day luxury tour from Lima to Buenos Aires. Highlights include an Amazon cruise, Machu Picchu, Rio de Janeiro & Buenos Aires. Explore the extraordinary Galápagos Islands, the culture of the Sacred Valley & the mighty Iguazu Falls on this 24-day tour from Guayaquil to Buenos Aires. Discover the charms of Patagonia with a 25 day luxury tour from Lima to Santiago. Highlights include the vast glaciers of Los Glaciares National Park.